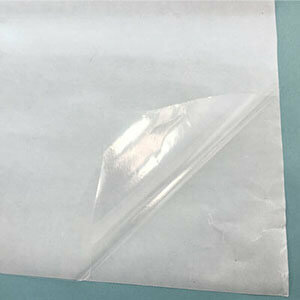 Hot melt adhesive film, also known as hot melt glue film, which is similar to double sided fusible interfacing. 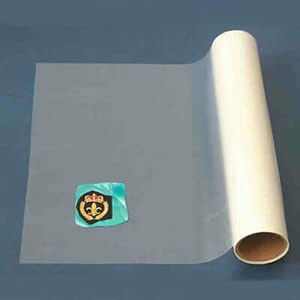 This product consists a layer of film and release paper. The adhesive film feels like ordinary film without stickiness in normal temperature, after heated to the melting point, the film layer has strong viscosity, can bond two kinds of materials permanently. Hot melt adhesive film has many advantages, such as environmental protection, wide range of sticky, bonding rapidly and so on. Generally produced by EAA, PA, PES, TPU, EVA, single or multiple synthesis of material production, mainly used for textile fabric, leather, plastic, foam, electronic field, metal composite. Usage: PET, leather, non-woven fabric, wood, paper, and other areas of the joint. Application: conductive fabric, embroidered badges, woven label back glue, flocking printing, textiles, PVC high frequency joint, etc. Adhesive scope: bonding of aluminum and other metals. Adhesive range: nylon, lycra, polyester, blended fabrics, wool, cotton, leather, ABS, TPU, paper and various elastic fabric composite processing.